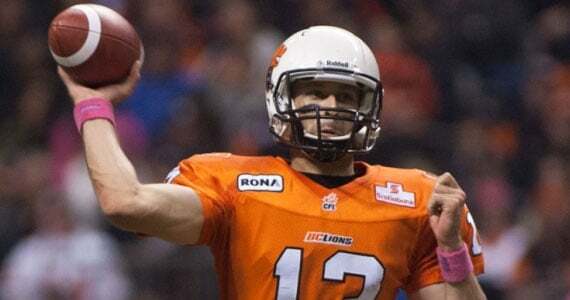 There is nothing like having depth when it comes to assembling a football team and the BC Lions proved theirs once again last night. Mike Reilly steered the Lions to a 39-19 victory over the Edmonton Eskimos to punch their ticket to the 2012 Western Final and I’m pleased to present my first place clinching thoughts, from the stands. After the interception on the first series, Mike Reilly took command of the team and settled in. I thought he made some hasty decisions at times, but that’s being extremely picky on my part. The Lions couldn’t have asked for more from their backup QB who showed all he has the tools to play. Watching his mannerisms on the field one might have thought Lulay was in the game. The offence sputtered a little in the third quarter, allowing Edmonton to stick around, but again I’m being picky. It was a very impressive performance by Reilly. Not only did Reilly prove that he has the skills to play, he also reinforced that no one in this league finds and develops quarterbacks in this league better than the Lions. I thought the unsung hero of the night was Tim Brown. Not only did Brown have a great night returning kicks, he was a force on offence as well, particularly on some nicely executed shovel passes. His 23 yard run at the end of the game was a nice way to cap a strong game in which he racked up 268 all-purpose yards. With the Eskimos doing a good job of containing Andrew Harris, Brown’s contribution was solid and well schemed by Jacques Chapdelaine and the Lions. Mike Reilly, Nick Moore, Courtney Taylor, Ernest Jackson, Maurice Evans, Brandon Jordan, Jabar Westerman, Patrick Kabongo, Jesse Newman. All depth guys who have stepped in for starters in the last few weeks and the team hasn’t missed a beat. The Lions now have the chance to get some guys healthy the rest of the way, but they’ll also have some tough decisions to make as it will be really tempting to keep some of these guys in. One could even argue that the offence has been more productive in the last three weeks then it was earlier in the season. Regardless as some of the players on this team near the end of their careers, it leaves you with a good feeling about the future. The Lions defensive pressure was relentless last night. It left them vulnerable to the long pass at times, but for the most part it had the desired effect. Eight sacks were racked up and Kerry Joseph completed just six passes all night long. When the defence wasn’t busy sacking Joseph, they were shutting down Hugh Charles, rendering the Eskimo offence a non factor for most of the night. Shawn Gore is quickly becoming the Lions go to guy on 2nd down. His clutch catches haven’t come without a price either as for yet another game he took another big hit when he was sandwiched between two Eskimos in the fourth quarter. Akeem Foster also contributed which was nice to see. His 47 yard reception after the Reilly interception on the first series was important in more ways than one. Ryan Phillips had more than one chance to get an interception for his newborn son and finally got one in the fourth to really put a nail in the coffin of the Eskimos. Phillips had to be shocked after Cary Koch’s highlight of the year candidate catch, but he had a strong game overall and has been really noticeable the last two weeks. Lions fans are really starting to get it and the crowd of just over 30,000 were again a factor. It’s getting loud on defence, and not just at the end of the game. Imagine what type of advantage the Lions could have at home if it continues to improve, or if we can add another 20,000 people for the Western Final. I just love this time of year as the playoffs approach. The crowds get bigger, the fans get into it, and I just can’t wait for November 18th.